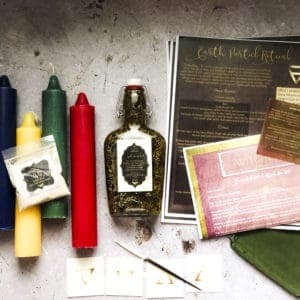 Each Witch subscription box is guided by a specific theme having to do with a transformative ritual, spell or magickal practice and includes the items listed below. 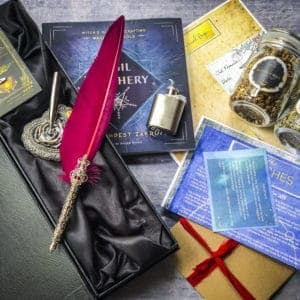 Every month after you have received your box, you'll get a private invitation to join a digital gathering online so we can go over the ritual of the box, added information about the magick involved and answers to whatever questions you have regarding your box and how to perform your spells. This is a truly special offering designed to deepen your Witchcraft. 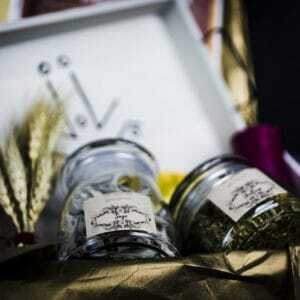 We send you a well thought out curated ritual with the items you need to perform it. It also just happens that the items we send you for your ritual are beautiful and well crafted and something worthy of being passed down to the Witchlings in your life when it comes time to do so! Every month you get Book of Shadow pages that you can add to your own Book Of Shadows. These pages guide you through the ritual and or spell in the box as well as providing you with magickal information on the items in the box. We believe in the power of a well stocked Witches Pantry! So each month you'll get 2-3 full sized bottles of herbs, or incense, or potions from our Witches Apothecary line along with information on how to use them for your own Witchcraft. Join a global circle of Witches in participating in ritual and magick each month as guided by the unique box theme. Guidance is included in each unique box via the Book Of Shadow pages. You'll be lead in how to use the tools sent to you each month in a manner that works for both new and seasoned Witches. We are on Instagram, Facebook, Pinterest and Twitter. There we share altar images, questions, thoughts and ideas on how to use the boxes sent out each month. Would love to have you join us! Want to make sure you get the next box? Subscription sign-ups for the upcoming box end when the timer runs out or the 15th of each month. Don't miss the next box and subscribe today. The Witches Box is a creation aimed at facilitating Witches in going deeper into their magickal transformational work. This is what your Craft is - ways in which you transform the state of things around you as well as yourself, through the deepening connection to the natural world. Each unique month takes you on that journey through the contents of the box. "I loved it, very nice box packed with love! Thanks so much! I am looking forward the next one, I arrived back home to it and it was very nice!" "I HIGHLY recommend these boxes for all witches from every experience level or path. Its a gift for you to enjoy and enhance your magickal practices! I love mine and can not wait to see next months!" "This is by far one of my most favorite witchy subscription boxes that I have ever tried! The intricate detail of each item, the curation of items that fit the theme perfectly, the over-all quality & attention to detail was just beyond measure & something truly special. The entire box gave off nothing but positive, magical vibes while opening." Aren't ready to subscribe? Get a single past box. These are only available while supplies last and won't be duplicated again. Get spells, discounts, free downloadable Book of Shadow pages and more by receiving the newsletter.